The Pacific Coast Shootout was established in 2014 in an effort to promote the positive growth and development of lacrosse on the West Coast. By bringing top tier Division I programs to Southern California, the Shootout aims to expose young players, their families, coaches, referees, and fans to the game being played at its highest, most competitive level. Over 5,000 fans enjoyed a great game between Denver and Notre Dame in our inaugural event. The Shootout is confident this exposure will ultimately help establish a superior standard for playing, coaching and developing lacrosse in the West. The cost of transporting two Division I college lacrosse teams from the East Coast is significant. The Shootout is responsible for airfare, ground transportation, hotel accommodations and meals for three to six days for team travel parties of 55-60 people (per team). Through its Patron Program, the Shootout seeks to defray these substancial costs and to build a solid, sustainable foundation of support for its mission. 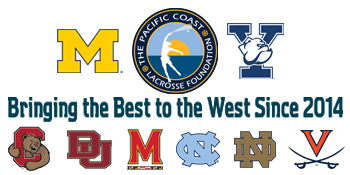 Patrons are encouraged to pledge annual support to the event, providing Shootout organizers with a portion of the funds necessary to continue to bring elite college lacrosse teams to the West Coast.